In 1977, Colin was a 20 year old, third year Microbiology BSc student at Melbourne University, when he was involved in a hang gliding accident resulting in partial C5 damage and complete C6 spinal cord injury. This left him as a quadriplegic able to use a manual wheelchair (if not strongly) and drive his own car using modifications (some of which he designed and built). While still in hospital, Colin started modifying his hospital supplied manual wheelchair. He lowered the front, had new axle sockets welded on to provide 'dump', modified the backrest and all this was done with very little precedent or research - Colin just knew what he wanted. Others tried his chair and loved the changes but it was another three years before he was designing a new chair for a manufacturer. It was made of thin wall, high tensile steel brazed together and with double X-folding crossbars for rigidity. It only weighed 26 pounds and was the first coloured powder-coated chair made in Australia. 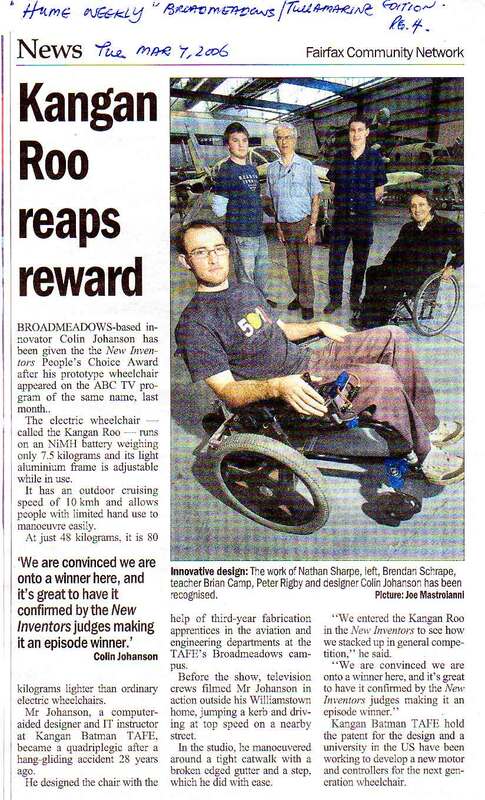 Colin also designed a road racing chair for a friend, Eric Hubel, where the frame only weighed six pounds. This chair was one of two chairs to beat the runners for the first time in Australia in a time of 2 hours 5 minutes in the 1981 Big M Marathon. 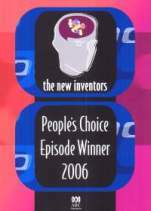 Although not a racer himself, he was able to interpret the needs of an experienced racer and create a radical new design. Colin has a background of a Bachelor of Science in Microbiology/Physiology and a Post Graduate Diploma in Ergonomics obtained in 1981. All his life he has been a designer and sportsman and had designed and built GRP kayaks, hang gliders, archery equipment, and hunting knives. 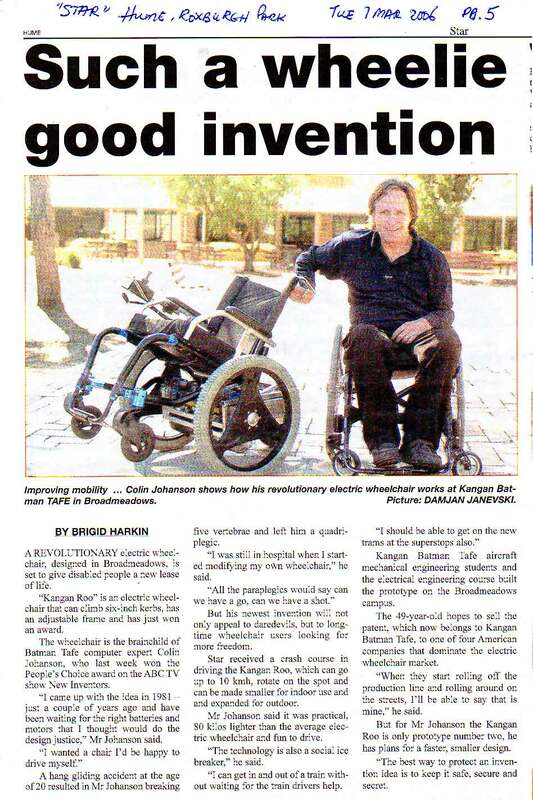 After his accident this continued with homes, wheelchairs, car driving aids, and he manufactured medical equipment on his own lathe/mill that he learnt to use after his injury. As a quad, he's learnt to adapt to maximise his abilities and minimise his disabilities. Colin has extensive CAD skills gained from using AutoCAD professionally as a furniture and office designer for nine years from 1985 and has extensive design and adaptive technology skills (he worked for a month in 2006 at CATEA, Georgia Tech). Colin worked full time as 'CAD & IP Coordinator' for an Institute of Technical and Further Education until 2007, still uses a manual chair and loves driving his SAAB Turbo 900. He returned to sports such as snow skiing, water skiing, (designing and building his own equipment) and now his main interest of sailing as both competitor and roles in club management . Details of these can be seen on his old personal website www.gizbytes.com . In 2005 Colin came 2nd in the Single Person Liberty Worlds in Sabaudia Italy. Colin was appointed firstly a member in 2006 and Chairman in 2007 of the International Association of Disabled Sailing (IFDS) Technical Committee. Moira worked behind the scenes for many years in the Rock Music business, then Television and Radio. A shift to the beauty industry then led to a 10 year stint with an international airline where she was an OH&S Rep., member of the 'First Response Team' set up in case of an airline disaster in the Asia Pacific region and developed and implemented a number of global company initiatives. Moira developed a wide range of skills in: training; team building; retail marketing; sales; and customer service from all these diverse roles. While raising her family, Moira's interest in design was directed into building and renovating houses along with garden design. Six years of voluntary work in the '80s brought insight into the lives of the disabled and young refugee students through her role as "School Council President" of a Secondary College with a high refugee population, and more than forty two different languages spoken! Moira was instrumental in starting and personally running one of the first school based "Breakfast Club" programs for both students and homeless young people, along with sourcing accommodation and running a homework group for 'double orphans' (no country, no family) and received several State and Local government awards recognising this ground breaking work. Moira has been known to comment, "After meeting Colin, it was as if all my previous work and interests came full circle!". When Moira and Colin got together it didn't take long for her to discover that they had exactly the same goals and aspirations, and that their skills complimented each other perfectly! This was exemplified in their cooperation in designing and Moira's project managing the building of their own 'dream' home. 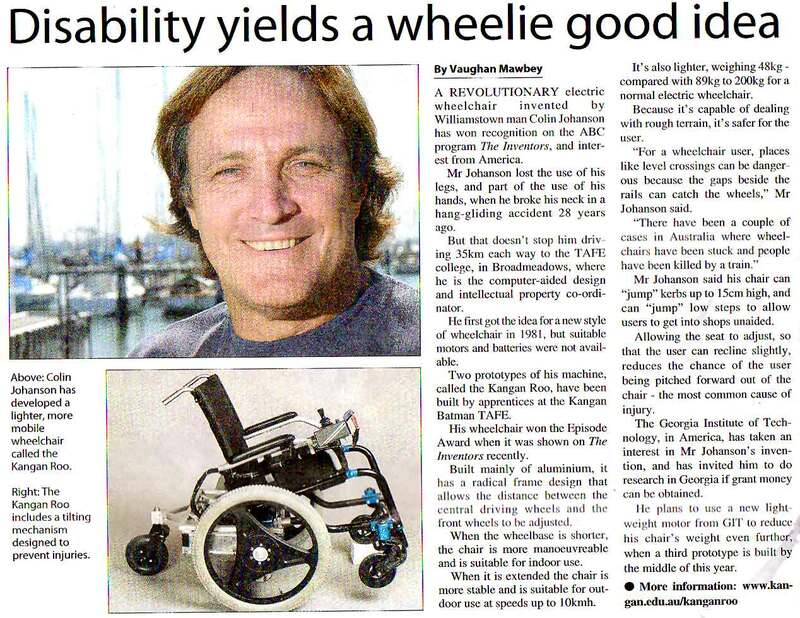 When the opportunity presented to launch "Cool Mobility" Moira and Colin decided that they would strive to bring the best looking, functional products to a market that had been generally dictated by non-disabled designers supplying for need, without a "Cool Edge". Moira and Colin want people to be proud of the equipment they have to use, and want the general population to see that, as with any personal items, style and innovation can extend to, mobility equipment too. It should be possible to have equipment become complimentary and an extension to a person's personality .